Modelling as an element in scientific methodology and models as the outcome of modelling are both important aspects of the conduct of science and hence of science education. The chapter is concerned with the challenges that students face in understanding the three ‘levels’ at which models can be represented – ‘macro’, ‘sub-micro’, ‘symbolic’ – and the relationships between them. A model can, at a given level, be expressed in ‘external representations’ – those versions physically available to others – and in ‘internal representations’ – those versions available mentally to an individual person. The making of meaning for any such representation is ‘visualization’. It is of such importance in science and hence in science education that the acquisition of fluency in visualization is highly desirable and may be called ‘metavisual capability’ or ‘metavisualization’. Criteria for the attainment of metavisualization are proposed. Two approaches to the ontological categorization of representations are put forward, one based on the purpose which the representation is intended to serve, the other based on the dimensionality – 1D, 2D, 3D – of the representation. For the latter scheme, the requirements for metavisualization are discussed in some detail in terms of its components. General approaches to the development of metavisualization are outlined. 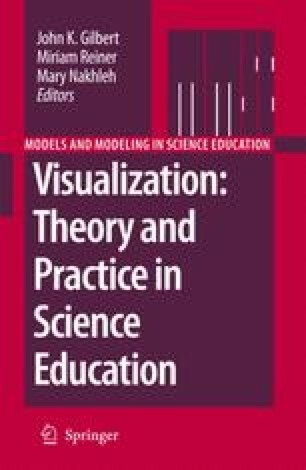 Multi-disciplinary teams are needed if the research and development needed to improve visualization in science education is to take place.